PEARL BEACH - Official Rating 4 Star - is a one-of-a-kind holiday city resort, is uniquely situated along the beach at the end of the famous Rethymno beach promenade, overlooking the Mediterranean and within walking distance (2,2 km � 1,3 miles) from the heart of the town. It is just the beach promenade that separates the hotel from the sandy beach. A 5-minute stroll will bring you to local shops, bars, restaurants, taverns and coffee-shops. All rooms are comfortably furnished and providing refrigerator, balcony with land view, double glazed windows, individually adjustable air condition, satellite TV, direct dial telephone and internet connection. Breakfast and dinner served from a rich buffet in a comfortable, bright and enjoying the sun restaurant. Lobby bar and a la carte restaurant �brasserie. 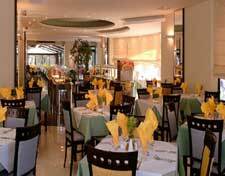 The main Restaurant �Pergola� At its beautiful terrace our guest can enjoy a wide selection from rich buffets. Open for Breakfast 07:30 till 10:00 offers American style rich Buffet Open for Dinner 19:00 till 21:00 offers pension menu with gourmet delights in buffet style Ala carte�brasserie - overlooking the sea and the pool �Loukoulos� Open for lunch from 12:30 till 16:00 and dinner from 20:00 till 23:00. A casual option for lunch or dinner with freshly prepared delicacies and favourite poolside snacks throughout the day. Lobby Bar �Sunset� is situated near Reception lobby. Open from 17:00 till 01:00. Pool Bar-Snack: Open from 10:00 till 01:00.